Linksys thinks MU-MIMO is the EA7500’s key selling point. It’s not. While this might be the least-expensive router to support MU-MIMO, that technology is just too new and under-supported on the client side to be anything other than a checklist item. Fortunately for Linksys, the EA7500 includes most of the features that do matter, and it delivers strong performance in general—particularly in the area of network-attached storage. Linksys has been building routers in this form factor for a number of years. It’s definitely a more mainstream look than the company’s aggressively designed WRT series, but it doesn’t go so far as to hide its antennas inside the enclosure in a futile attempt to blend into your home’s decor. The EA7500 uses Linksys’ Smart Wi-Fi firmware, which has a newb-friendly GUI and the option to access, configure, and manage the router from the cloud. Download the Smart Wi-Fi app to your Android or iOS device, and you can even set up the router using your smartphone or tablet—no computer required. The Linksys EA7500’s USB 2.0 and USB 3.0 ports are located on the back of the router. The EA7500 has one USB 3.0 and one USB 2.0 port, both in back, which enable you to share both USB storage and a USB printer over your network at the same time. A DLNA media server will stream audio and video files to compatible devices, ranging from a home-theater PC to an A/V receiver, on your network. Linksys chose a Wi-Fi chipset that includes support for MU-MIMO (multi-user multiple input/multiple output), but this isn’t much more than a checklist feature at this point in time. There are very few Wi-Fi client adapters that support MU-MIMO, and you need the technology at both ends of the connection for it to do any good. Click here for an in-depth look at MU-MIMO. 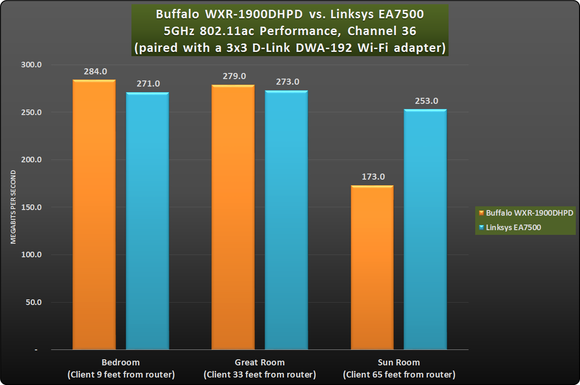 When I compared the Linksys EA7500 to another mid-priced AC1900 router—Buffalo’s WXR-1900DHPD—the Buffalo won most of the rounds on the PC. 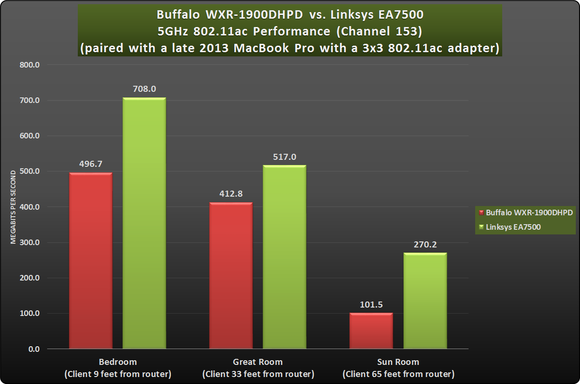 The opposite was true, however, when I measured the two routers’ 802.11n performance. The Linksys EA7500 was slower when paired with a Windows client with a USB 3×3 802.11ac adapter, but faster with the notebook’s onboard 3×3 802.11n adapter. The EA7500 has rudimentary parental controls, but they’re much better than what Buffalo’s router delivers. You can restrict individual network clients (up to 14 devices) from getting onto the Internet according to days and times, or you can allow every device to connect to the Internet, but block particular sites. This would be good enough to block your kids from going on Facebook when they should be doing their homework, but unless you know the URL for every objectionable website on the Internet, you’ll never keep them from getting to the seamier side of the web. Alternatively, you can use a third-party domain-name server provider, but Linksys gives you only two choices: Dyn.com or No-ip.com. 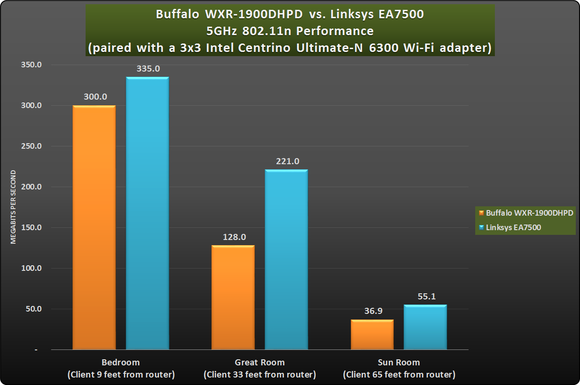 Interestingly enough, the EA7500 beat Buffalo’s router when I benchmarked its performance with a MacBook Pro, which has a 3×3 802.11ac adapter onboard. 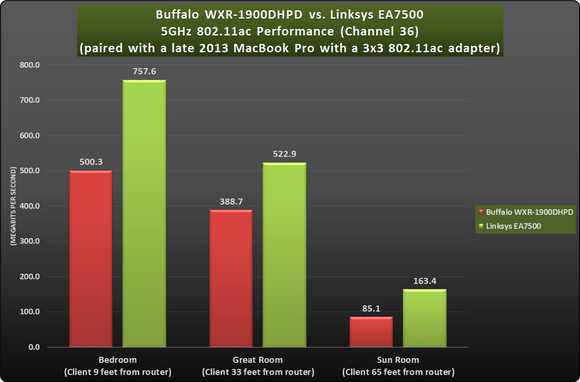 The Linksys EA7500 delivered very high Wi-Fi performance with a MacBook Pro. If you don’t want to spring for the cost of a NAS box, you can plug a USB storage device into the Linksys EA7500, and use it to share files or stream media over your network. The router supports USB hard drives formatted NTFS and FAT, for use with Windows machines, and HTFS+ for use with Macs. Unfortunately, Mac users won’t be able to use that storage for Time Machine backups. The EA7500 is very fast when it comes to file transfers over its USB 3.0 port, reading a 10GB collection of files from a portable USB 3.0 SSD attached to the router at 246Mbps on a PC and writing it back to that drive at 258Mbps. The numbers on the Apple platform are lower because the iMac I used for testing has a mechanical drive instead of an SSD. I was able to transfer the 10GB collection of files from the portable SSD to the iMac at 141Mbps, and write it back to that drive at 42.6Mbps. 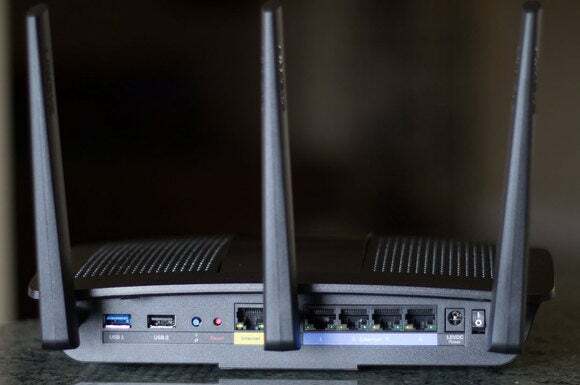 The Linksys EA7500 is a very good router for $200. It’s easy to set up and use, it has a strong set of features (although it is missing OpenVPN and Time Machine support), and it’s relatively fast. 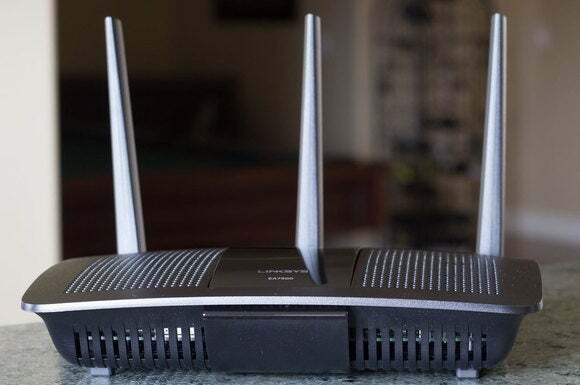 Linksys puts a lot of emphasis on the EA7500’s MU-MIMO support, but that standard is just too new to be all that relevant; don’t buy this router for that feature alone.